TGIF! In celebration of National Poetry Month, here’s a poem by Ashton, a fourth grader in Ms. Rich’s class at Pioneer Crossing Elementary. Ashton writes a powerful and brilliant poem that tackles the difficult subject of losing a parent. Another day in National Poetry Month means another poem! 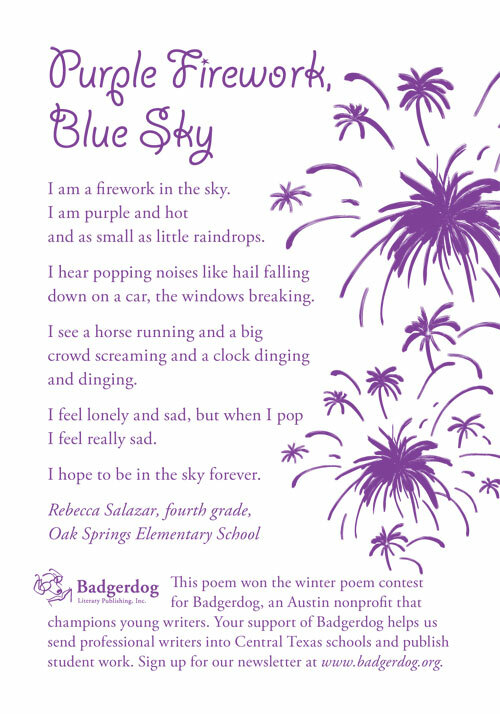 The poem “Wonder,” by Jordyn, a fourth grader at Pioneer Crossing Elementary, was another finalist for Badgerdog’s Spring Poem Contest. Jordyn personifies earth in her poem, wondering if it minds children playing on its surface or if it speaks to the birds chirping. Her beautiful poem reminds us to think about our effects on earth, whether they be big or small, and to keep its unique wonder alive. hopscotch on his concrete scalp? Oh I wonder, I wonder. To continue our celebration of National Poetry Month, here’s a poem from Amy, a fourth grader in Ms. Rich’s class at Pioneer Crossing Elementary. What Is the Color Gold? Gold is the color of a bright bird. you will go to the hill and watch the sunset. the most important thing to her—a ring. People born in the year of the dragon are thought to be brave, innovative, and driven. In Chinese mythology, the dragon is legendary: it is powerful, majestic, and revered. And so we begin this new lunar year with the finalists of our New Years’ poem contest, who show us how we can approach the coming months: with the power of forgiveness, with our majestic senses, and a reverence, as always, for hope. I am a clock. I am a very big clock. I am in the town. I hope I can change time. We’re officially halfway finished with this first month of the new year. Some of us made promises to ourselves a short two weeks ago. Some of us may have already broken them. And that’s OK because here’s the thing: every single day can be a new beginning. 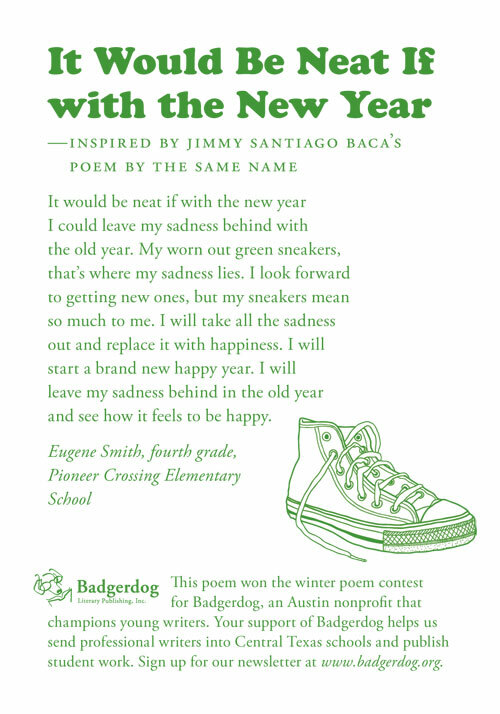 That’s the feeling we get when we read the remarkable poems that won Badgerdog’s New Years’ Poem Contest. Fourth graders Eugene, from Pioneer Crossing Elementary, and Rebecca, from Oak Springs Elementary, know what it feels like to want a new start. They know how important hope is—how a new start can’t happen without it. And their poems are a great reminder that even if we fall behind, even if we didn’t get out of the gate fast enough in 2012, there’s always time to put a little bit of sadness away to make room for some happy.